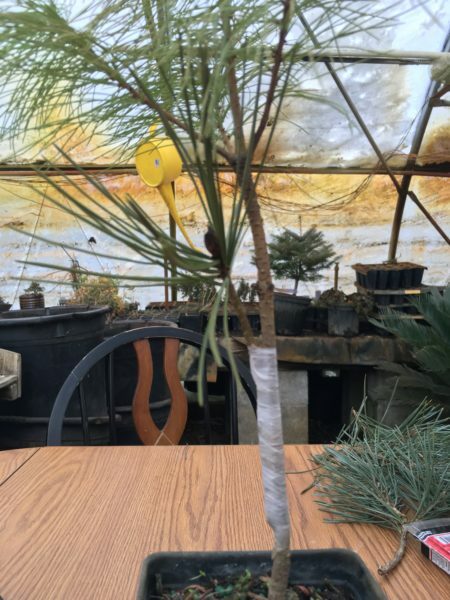 What do we do at the nursery during the Winter? Well, I wish we went to Florida! However, we stay right here in NE Indiana and take care of a lot of sleeping plants. Every winter is a little different. 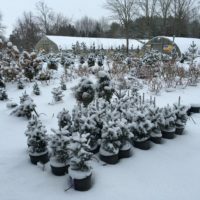 During the Blizzard of 2012/13, we just tried to keep access to all the greenhouses open. That year there were 4 solid months of snow along with the nasty Polar Vortex which plummeted the windchill down to 42 below zero! In 2015, we refurbished and rebuilt our potting trailers. All that dirt and water has a way of breaking them down over the years. 2016 included the need for some directional information, so we made a large assortment of signs for the nursery: 2 signs for the roadside, parking lot signs, and signs for all of the greenhouses to show what types of plants were inside each one. Last year, as we do every year, during the winter we cleaned up all the perennials. We also added lots of pictures to the website, and we updated the pot sizes. Our most exciting winter project though was to graft dwarf and unusual conifers again. Conifers is just another name for evergreens, by the way. It means cone bearing plant. For whatever reason, I have always been super intrigued by the propagation, growing, and promotion of these plants. We had taken a break from grafting for a couple of years and felt it was a good time to restart. We were fairly successful with our grafts last year, so this winter we have continued grafting our conifers and propagating other plants as well. We recently made stem cuttings of some Chamaecyparis pisifera and Junipers. So far Winter 2018 has been pretty mild, and I would love to get going on another project! However, I know just how quickly our mild weather can change. Consequently, I’m counting the days until Spring! If you have a Spring landscaping project you would like to start planning, now would be a great time to begin the process. Additionally, if you have landscape maintenance or tasks in your garden that you need assistance with, we are available to help you. 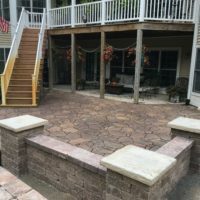 This was our first patio with sitting walls. Last year we began installing concrete paver sidewalks and patios. If you have been thinking about a hardscape project for Spring/Summer 2018, we would love to hear about it. Please contact us at the nursery at 260-244-7420 and leave a message. We will call you back promptly to set up an appointment or meeting to discuss your needs.